Kevin is an extremely experienced DJ and Compere, which combined with his bubbly and friendly personality, creates an interactive event for your guests to enjoy. He will play a variety of music (to which you will obviously have an input) ensuring that everyone goes away having had a great night of fun and entertainment. Whether you're celebrating a 21st birthday, anniversary, school prom, or indeed your special wedding, you can be safe in the knowledge that Kevin will be able to cater for your musical requirements (whatever that may be). 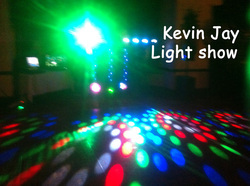 The equipment that Kevin uses is of the very best quality from Microphones, Mixers and PA equipment, right up to the state-of-the-art lighting set-up that Kevin will provide. Kevin has full public liability insurance and all his equipment is P.A.T. tested in accordance with legal requirements.